Electronic Games for Seniors Combo. - SORRY THIS ITEM IS OUT OF STOCK! 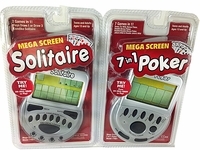 For a senior that loves handheld electronic games, we offer a combo of our bestselling solitaire and poker games. With our combo deal, you get two electronic games combined for one lower price. the combo consists of two different handheld games. The first one is our electronic handheld poker game. It has a roomy screen for viewing which measures 4" w x 1.5". The poker game has three different ways to play- Loball, Draw and Deuces. 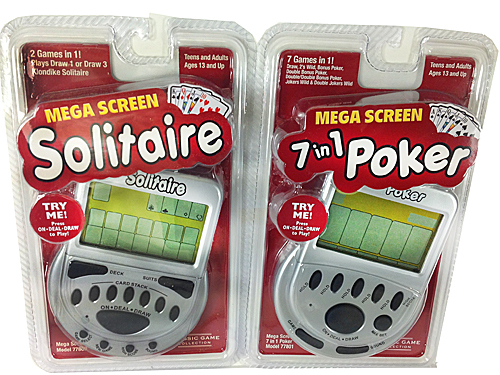 Our second electronic handheld game for seniors is a solitaire game. The letters are approximately 1/4" high. Choose from 3 card Klondike, or Draw 1. PLEASE NOTE: THE SCREEN IS NOT BACKLIT. Choose more games from our games for seniors page. �1998-�2019 Seniorstore.com� All rights reserved.